Rutland Gate South Garden and Upper Garden are two fairly narrow gardens in a long dog-legged enclave running off Kensington Road. The early C19th planned layout of this imposing range of terraced houses and their shared pleasure grounds survive virtually intact. The original piers and railings to Kensington Road survive but have been replaced elsewhere in the gardens, the South Garden bordered by fencing and concrete posts. Eresby House, a huge 1930s interloper occupies a site between the two gardens, and has a trim contemporary forecourt garden. private. South Garden, keyholders only but has opened for OGSW. 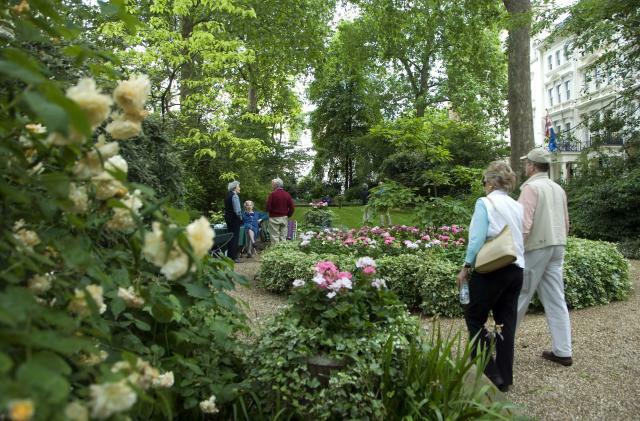 Rutland Gate Upper Garden was in the ownership of Cubitt Estates Limited and, according to the Report of the Royal Commission on London Squares (1928), those granted access were freeholders and leaseholders of Nos. 1 to 19 (odd) and 2 to 26 (even) Rutland Gate, whose leases contained a covenant 'that the lessee should pay due proportion of cost of maintaining the entrance lodge and the ornamental piece of ground enclosed and planted for the use and benefit of the several tenants of Cubitt Estates Limited at Rutland Gate'. The Report went on to comment: 'As Cubitt Estates Limited and their predecessors in title have never granted any rights to enter the gardens, they presumably could if they wished resume possession of them and of the entrance lodge.' The garden was maintained by a Committee appointed by Cubitt Estates Limited and the lodge was occupied 'rent free by a man appointed by the Committee to look after the enclosure'. It was described as a 'long narrow enclosure laid out as a shrubbery'. Today, the Upper Garden is locked and is left unmanaged, with long grass, shrubs and trees including London plane, lime and tree-of-heaven. To the south of this, the Lower or South Garden was described in 1928 as 'a long narrow enclosure surrounded by a sparse privet hedge and laid out with lawns and flower beds' and contained 'some well grown trees'. Today, the garden has two lozenge shaped lawns either side of a circular raised bed in front of the main entrance gate, with perimeter gravel paths. Between the paths and the boundary of the gardens are low raised beds with shrubs and trees, and there are a number of decorative planters. There are twelve C19th lamp standards around the surrounding pavements. The South Garden is owned by residents in the adjacent terrace, who pay an annual sum for maintenance.